It might sound strange coming from a self-described people person, but for Dr Phil Worley the best part of the time he spends with his patients is the moment he tells them they don’t have to see him anymore. That’s because bowel cancer patients must be clear of cancer for a full five years before they can be considered cured. “My best consultation is my five year consultation,” he says. It’s a moment that has added meaning for Phil, whose mother, mother-in-law and father-in-law passed away from cancer. Specialist general surgeon Dr Phil Worley with a patient at North Eastern Community Hospital. As a general surgeon who primarily carries out abdominal surgeries, many of Phil’s patients require complex procedures to treat cancer, as well as other conditions of the bowel and gall bladder, and various types of hernia. Many of these procedures are performed via keyhole surgery, which Phil describes as a bit like a video game; it’s fun but extremely difficult because you work remotely in 2D using long, knitting needle type instruments while watching a video monitor. While there is a great deal of skill required to perform these surgeries, Phil believes it’s equally important to be able to relate to people. “It’s more than just being able to cut – that’s important, but you should also be a people person,” he says. Phil didn’t come to surgery immediately. A keen basketball and tennis player from a strong sporting family, he was first drawn to sports medicine before training as a GP surgeon so he could work in country communities. Phil spent two years training at a regional hospital in the UK, before taking a position servicing the community in Clare as a GP surgeon. He loved the strong connection to community that came with working in the country, but soon decided to apply to train as a specialist surgeon so he could carry out a broader, more complex range of surgeries. 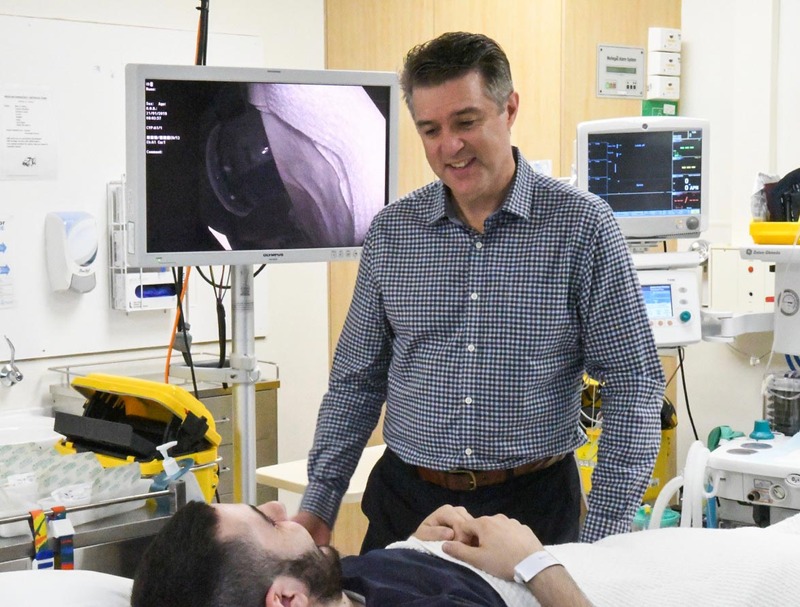 After six years of further training, Phil landed a position as a surgeon at Modbury Public Hospital, and started also seeing private surgical patients at North Eastern Community Hospital 19 years ago. Having worked as a visiting surgeon at a range of private hospitals across South Australia, Phil believes the facilities and staff at North Eastern are amongst the best. “The great thing about North Eastern is that you can do almost any surgery there. The endoscopy suite is also one of the best private suites in the state. In addition to his private practice, Dr Worley continues to work as a surgeon in the public sector, where he says he values being able to teach the next generation of surgeons so they can look after him one day, if need be. One of those next generation doctors is Phil’s own son, Matthew. The youngest of three sons, Matthew has just completed his first year of medicine. And while Phil didn’t push his son into the profession, he’s happy with his decision.